Tsutsugaki, the Japanese Indigo Textiles, an exhibition hosted by The Guimet Museum of Asian Arts. To summarize, let's say the technique of Tsutsugaki is roughly like the Batik Technique. On a stripe of cotton cloth (even wide fabrics are assembled from narrower stripes) some rice dough glue is applied with a conic shape tube tool (the Tsutsu). The artist uses the glue like a pencil on a sheet of paper. Literally, the glue becomes his pencil and he can draw the motifs (the Gaki) that he imagines. The second step is to dive the fabric into an indigo dye bath. For the last operation, the artist removes all traces of glue, allowing the motif to appear where the dye didn't reach the fabric. Consequently, this exhibition offers a large range of indigo pieces. Some are deep blue, other are light blue, depending on the age and the wear of the object. The more recent displayed pieces date from the late 19th or the beginning of the 20th century. The oldest pieces date from the 16th and the 17th century. Usually, the Japanese offer the Tsutsugaki pieces for happy events: weddings, births, special occasions, because some benefic power is attributed to them. The technique of Tsutsugaki decorates kimonos, bedcovers, banners or screens. The most common motifs are: kitchen utensils, the Mont Fuji, the Mont Horai. Symbols of luck and longevity habitually originate from popular legends, fables and mythologies. The Guimet Museum has spacious and modern facilities, a rare building with the comfort of air conditioned. A real treat during those days of heat. The last Sunday afternoon once again, the Champs-Élysés boulevard was jammed, this time with the important event of the finish line of the race. The racers were supposed to arrive in the evening for a big illuminated bash. I didn’t intent to wait that long, even if there was a lot of entertainment, in the hope to make the crowd wait until the winners arrive. 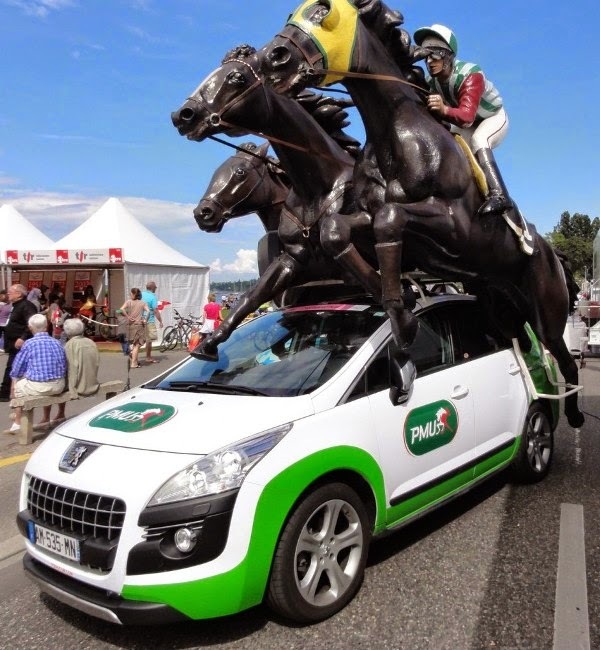 This is tradition for the parade of floats to follow the Tour de France’s cycling racers and to throw little promotional gifts toward the crowd. People come to admire the athletes but also for the promotional gifts. Sadly, in Paris, there weren’t little flying-in-the-air gifts. The gift stocks must have been back order. Maybe this is why the crowd’s entertainers didn’t succeed to inspire applauses. It’s difficult to make people excited in Paris. 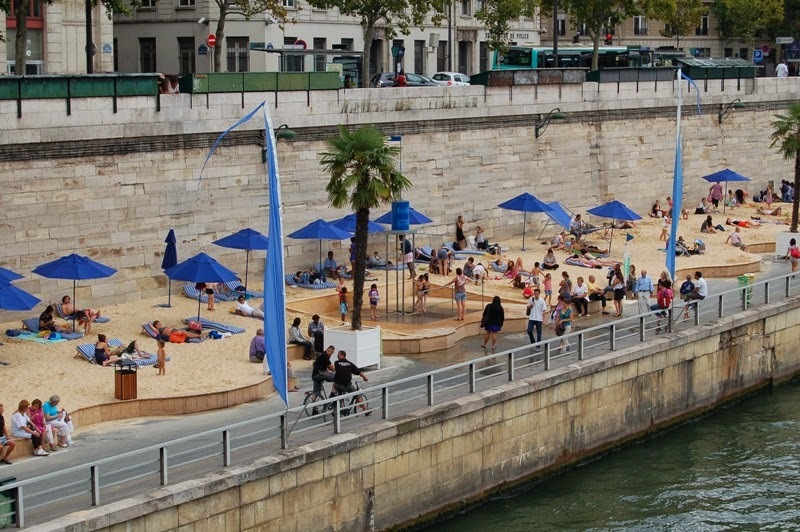 For the Parisians whom can't afford to go to the beach in vacation, the city's administration organizes the event Paris plage. The Seine's banks are arranged to give the illusion of being on the sea shore. Well, this is the sea. I live in the 4th borough of Paris, named Le Marais (the Marsh), right in front of the Pont Marie (the Mary Bridge) which links me to Île-Saint-Louis (St-Louis Island). Last night, we were shaken by a violent rain storm, worthy of Dante's Inferno. With no refreshing result, the dog days still stay and make us sweat profusely. 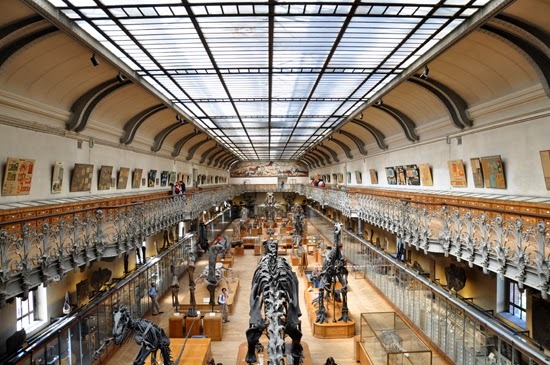 Every time I come to Paris I make a duty of going to visit the Museum of Natural History and my favorite attraction is the Paleontology's Gallery. This building is glorious, illustrating the architecture of a former era. It was especially built for the 1900 Universal Exhibition of Paris. At the end of the 19th century, an architecture mixing exposed metal beams associated with the stone was avant-garde. The decor is inspired by Nature. Ferns multiply inside the building in a very decorative frieze. When one penetrates in this gallery, one feels like if one was travelling back in time, exactly like in a Jules Verne novel. At the beginning of the visit, all the dinosaur’s skeletons walk toward us, in giving the impression they are welcoming us. What an intense beauty this herd of beasts has! In the gallery, there are over three floors a multitude of specimens of vertebrates and invertebrates; of terrestrial animals, aquatic and avian creatures. Those objects are samples of still existing species and of long time disappeared species. They present themselves under the form of skeletons, mommies, animals preserved in formalin and fossil specimens. Here you are, puzzled by the apparent no link between the paleontology and the embroidery. In fact, I draw many sketches of primitive form of life like: "cadonites", "sao hirsuta", "harlania" and "antedon pennatus". They are full of inspiration for me, for their shapes or even for their exotic names, as titles, one fine day, in my embroidered creations. We will have other occasions to talk about this subject. In addition of the Museum of Natural History, there is a huge park with a zoo, large green houses, galleries of geology and mineralogy, the Gallery of Evolution. And the park can host perfect picnics. For two years now, I've been preparing this travel, in particular by reading of Artisans et métiers d'art de Paris (The Artisans and the Crafters in Paris), edited by Gallimard, in 2007. On each page a specific handcraft is illustrated: mentioning a specific workshop, a specific art, an artist (or artisan) and a piece of art. Every address is clearly indicated, even the nearest subway station. For instance, the book offers information about jewellers, custom shoemakers, costumers, clockmakers, puppet masters, mosaic cutters and setters, etc. I've made an oath of visiting EVERY artisans, not only textile related creators like embroiderers, costumers, couture designers, feather seamstresses, glass blowers. So, I begin by the nearest one from home, the picture framer Luc-Michel. After the usual greetings, he right away answers that he’s in mourning! At a certain point in the conversation I realize that his dog, Mof, is dead. He shows me many photos of his long time companion, a magnificent Dalmatian. The dog was named after the acronym of Meilleur Ouvrier de France (The Best Artisan of France's award). Luc-Michel received this honor in 1997 in the Picture Framing category. The man has been practicing his craft for 30 years now. He complains about the heavy financial charges. 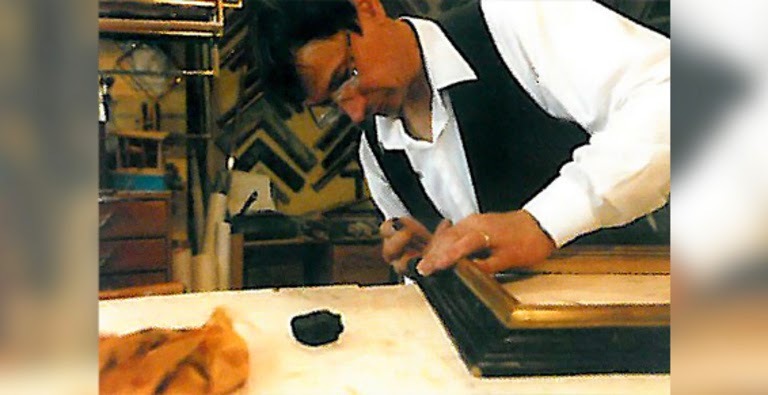 The clients are short of money and can't afford anymore beautiful handmade picture framings. The school of artisans doesn't provide an adequate formation for the young ones, to face the new challenges of the market. At the end of the month he barely has enough for a decent living. In those circumstances, why does he persist in this line of work? Maybe because of a passion for his work still burning in his heart? “Not really”, he says. Only because he likes to create beautiful framings. And when his last hour will come, he wishes to pass away while finishing his last framing. Love reading about this - makes me want to go to Paris and see some of these wonderful sights!